A new dimension in textile design. 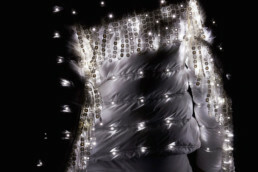 Experience high-tech in unprecedented sensuality with our e-broidery® light textiles. Forster Rohner AG is one of the leading companies for fashionable embroideries for Haute Couture, Prêt-à-Porter and lingerie. In combination with our innovative e-broidery® technology we are able to create unique fabric masterpieces.